Product #742 | SKU 2410-014-110 | 0.0 (no ratings yet) Thanks for your rating! Produces a true, bright collimated LED beam. Same features as the StealthLite™ 2400 Flashlight, but with the LED module that produces a true, bright collimated LED beam. 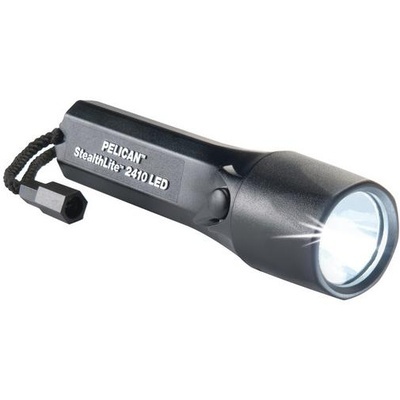 The Pelican 2410 StealthLite Flashlight (Black) is corrosion proof, resistant to extreme temperatures, and submersible. It is powered by 4 AA alkaline cells (included). For hands-free operation, attach it to your hard hat with our optional helmet light holder.